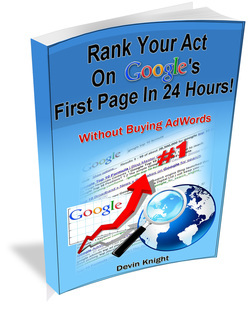 Rank Your Act On Google's First Page In 24 Hours! This is e-book #1 in Devin Knight's "Magic Marketing For Magicians Series". If you need bookings now and you have not worked on your website SEO (search engine optimization) you will benefit from this e-book. In every case you will find Devin Knight is listed for all these categories on the first page and NONE OF THE SEARCHES INVOLVE HIS NAME!!! NO EMPTY PROMISES. You can achieve the same results, if you follow the steps in this e-book. Although this ebook was written mainly for magicians, any entertainer can use the techniques to get on the first page of Google searches. Take your career to the next level, get more shows with a front page listing on Google. It is easier to do than you think. Stop spending hundreds a dollars a year on Google AdWords when you can get on the first page naturally. All you need is this e-book. PDF sent to your e-mail within 24 hours of purchase. Click below to order via PayPal or credit card.